Welcome to a basic guide on How to Use the Steam Client! Before you begin, you should sign-up for Steam here. Make sure your PC or laptop meets the system requirements before making your account. Are you using Windows or Mac OS? Those of you who’ve never used Steam would be best to learn about how it works since it is one of the best PC gaming platforms around. 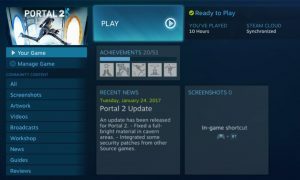 I’ve created a general overview of the Steam interface, how it works and how to navigate the menus. There are two different modes for Steam’s user interface I’ll describe for you, which are Window Mode and Big Picture Mode. I think the former has clear-cut menus that are easier to navigate. 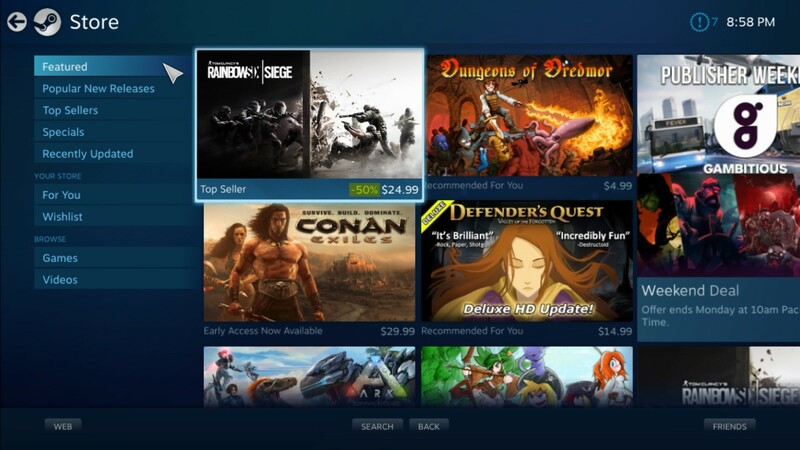 With Window Mode, everything loads faster and shopping for games is easier since it has direct access to different genres, featured games, special offers, what is trending among friends, your game queue, upcoming releases, games under $10, and recommendations based on what games you previously played. Steam store suggests I should try To Burn in Memory. This happens when you scroll down the STORE page which lists every category of games you can imagine. There are options such as adding games to your wish list or viewing the product page. For instance, if I clicked “find more like this“, then Steam will help me select similar games based on their customer’s tags. Under the LIBRARY page, you can scroll down to see all the games you’ve purchased and double-click on any you want to download or play if it is already installed. Click the +ADD A GAME in the bottom left corner to store new games in your Steam cloud drive. The dates show when you last played a game and you can view your friend’s list to see who’s online. There are categories for Store, Library, Community, and your Profile. The community page has almost everything from screenshots and walkthroughs to video game fan art. 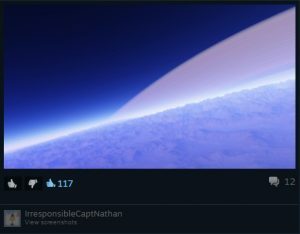 Under Community Activity, Steam keeps track of your recent views and the most popular artwork/screenshots every week. With Big Picture Mode, the layout is more similar to that of an actual console as the front page has all your recently played games and ones you download. (It is accessed by clicking on the console in Window Mode.) The top menu is similar but has a chat option where you can invite friends to games and view your friends’ profiles. A CGI Screenshot from Space Engine. 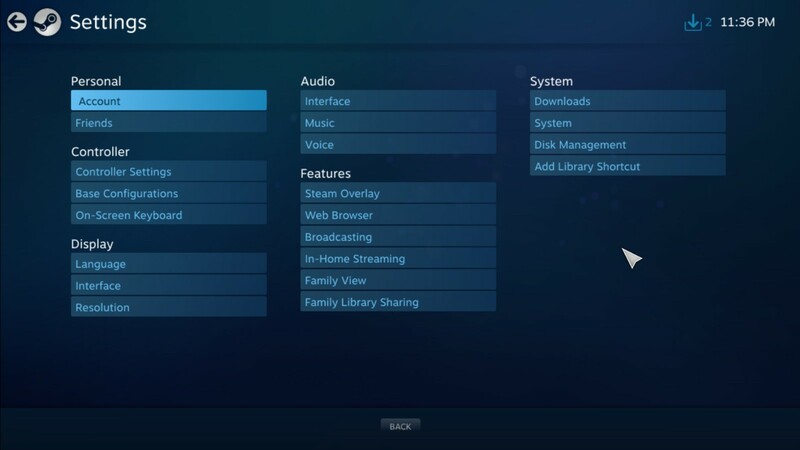 You can browse related news or tamper with your settings in family view, system management, and library sharing. In Big Picture Mode, you get to find games by using tags when searching. The Store offers games in featured, top sellers, and popular releases. If you like them then the wish list is a good place to track your preferences. Your Steam Library stores not only your games but any records of purchased software, music, tools, and even VR (virtual reality). You can keep track of your favorites, downloads, and games you share with your online friends. The Library games are organized by alphabetical order though you will find that Steam recognizes which games you were just playing or haven’t touched in a long time. That being said, I personally recommend using Window Mode for shopping purposes and Big Picture Mode if you just want to play games from your library. Either way, you’ll get complete access to Steam. In my opinion, Window Mode is better since I almost exclusively game on my laptop and Big Picture seems to be suited to playing on widescreen TV while using a console. Big Picture Mode tends to load slowly when navigating multiple pages and freeze sometimes when I want to launch a game or complete updates. But your mileage may vary in case you have a better network signal and more GB of memory on your computer. 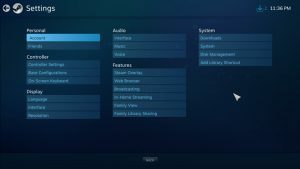 The Steam Settings section in Windows mode is a bit complicated as you can toggle your account settings or troubleshoot technical issues you’re having. It covers a really long list of possible options: Account, Friends, Family, In-game, In-Home Streaming, Interface, Downloads, Cloud, Voice, Music, Broadcasting, Web Browser, and Controller. The ones I normally adjust have to do with Friends’ notifications or managing Family Library Sharing when I can’t play my friend’s games. The Interface gives you the decision on how the Steam window is launched. Would you prefer to run Steam in Big Picture Mode? And what’s your favorite window? 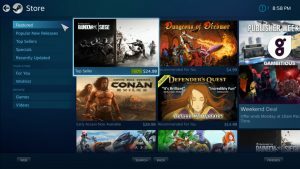 Continue reading my reviews on PC games from Steam or learn about Steam Keys and how you can use them to activate games. 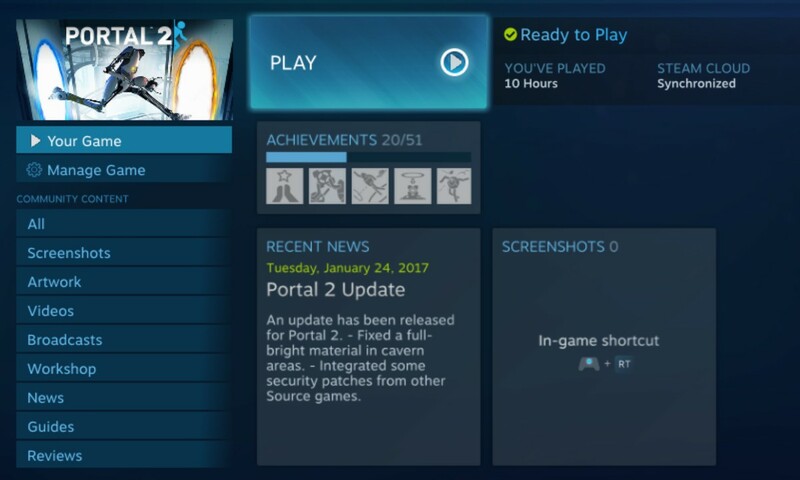 I have been a long time user of steam for many reasons, the ease of downloading games through 1 library, your games are tagged to your account and of course the sales that are so often that my library are flooded with tons of games and many which I haven’t even started on (argg not enough time). Steam is definitely one good platform and it is a must that all PC gamers get it! Hi again, I can sympathize with you on that! Lots of cheap games and excellent discounts just not enough time to play them all. The PC games on Steam are also far more entertaining than a subscription to FreeRide or Iwin games since a lot of those are just puzzles or point & click.